The easiest Halloween treat you might ever make. I was tapped to bring treats to MiniMac's class party yesterday. I made cinnamon nutmeg brownies. YUM. AND thought I would make something simple especially for the kids. It takes less than ten minutes, and apparently trumped my brownies in terms of popularity, with both the little and the big kids. Pardon the pic, Blackberry is not Nikon. Directions: Warm the caramel or if you are making it from scratch, allow to cool and thicken. Warm the chocolate or if you are making it, same thing as the caramel, allow to cool. 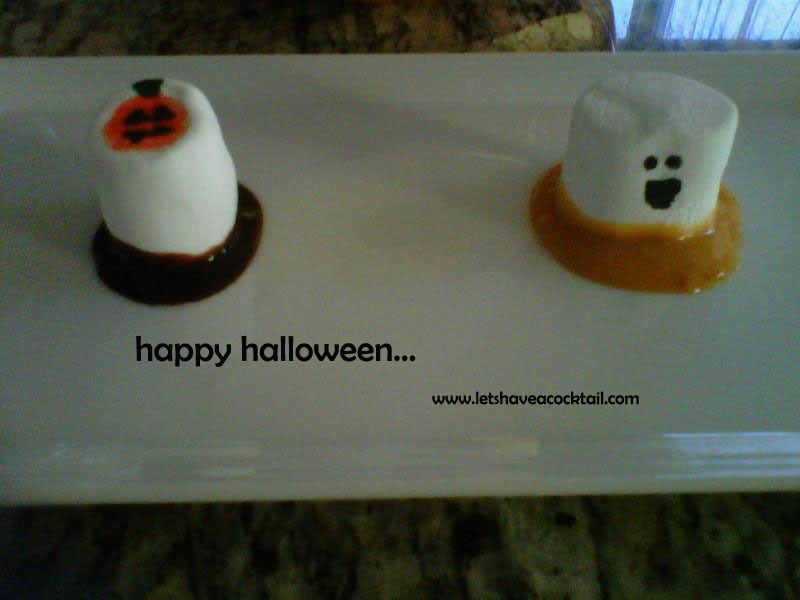 Using your pens, decorate the marshmallows with ghost faces, pumpkins, or bats. I also wrote BOO on several. You can certainly go to town here with other accoutrements to make faces, hair, etc. Dip each one in either chocolate ganache or caramel. I dipped some almost halfway. Place on waxed paper and allow to set. Store in airtight container until you are ready to serve. They are sticky but oh, they are good. And yes, you will need to explain to at least one person that no, you did NOT use magic marker on the marshmallows. Yes, someone did ask. 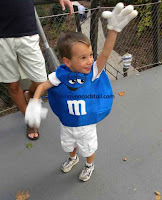 We are off to a party tonight and then taking this little m&m trick or treating tomorrow night. He doesn't eat candy but he loves trick or treating. Let's see how long that lasts. Personally, I hope he never likes candy. haha. Great costume! I love the unique ones! About time marshmallows pulled their weight, lol. What a neat idea! I'm going to have to give it a try. Love your little M&M - darling costume. And, aren't you lucky that he doesn't like candy - wish I didn't! I knew I wouldn't be disappointed with your ideas. Mini Mac looks adorable! Those look fun and kid friendly! My grandson and I will have to make those together. He also is not a big candy eater. Until last year he really did not like trick or treating. The first year he only wanted to go to 2 houses. I think he was about 5 before he would go down an entire street. Now that he is 8, he is in to it a little more but still not a big candy eater. Good for me because I AM! Awww, he's too cute. And he doesn't like candy? That's good news for you! Erm, you can send me his candy if he doesn't want it. Mini-Mac/M&M it all makes sense. He's adorable as a blue M&M! Good heavens, girl, is there anything you don't do? I'm in awe, Jenny, I really am. And that is one darling M&M, sister. So funny to hear that! My kids love the trick or treating, but want no part of the haul! Enjoy your trek with the cute, blue, M&M! I'd comment, but I'm off to the store to buy marshmallows, chocolate, carmel and sharpies. Great Halloween treats. And that is one cute M & M.
MIne are geeked about tomorrow and, unfortunately I gave up trying to keep them from candy a few years ago. Our agreement now - they get the candy if I get all the Snickers..
btw...what's up with trick or treating on Sunday night..seriously??!?! If I get mine in the bed before 10 I'll be thrilled. What a fun snack idea! Your little guy looks adorable. Very cute! I love the little caramel one with the face. It looks so easy and fun. Marshmallows are my favorite!!! Cute idea. And your sweetie is the cutest. Who needs candy when you got all that goodness oozing from your pores?!?!! Fun to make! I can see adapting these for other holidays, too. Thank goodness for Michael's for supplies! Mini-Mac is cute as can be-- hope nobody gobbles him up as the tastiest M&M ever! Cute idea! I didn't know there was such a thing as food safe markers. (SO thank you for saving me the embarrasment of asking...) ha ha. hehe The boys would love that. I hope the MiniMac got MaxTreats!